How Do You Divide Complex Numbers Using Conjugates? 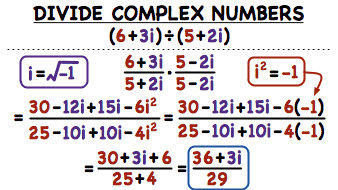 To divide complex numbers, you usually need to multiply by the complex conjugate of the denominator. Follow along with this tutorial to see how to find that complex conjugate and multiply with it to perform the division! How Do You Multiply Complex Numbers Using FOIL? Get some practice multiplying complex numbers together using the FOIL method! This tutorial takes you through the process of multiplying two complex numbers together.